On September 21, 2015, the New York City Association of Hotel Concierges awarded Applause Theatre and Entertainment Service, Inc. the 2015 Concierge Choice Award (CCA) for Best Entertainment Service. 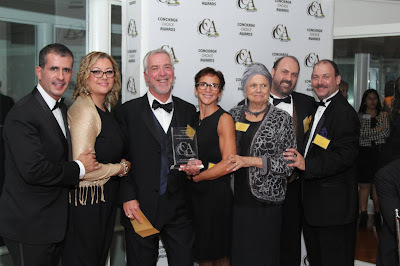 Established in 2007, the CCA recognizes elite companies, organizations and individuals in the restaurant, retail, theater, attraction, service and transportation industries, who create exceptional experiences for New York visitors. Richard Gladstone, Owner of Applause said, "Thank you for making us the winners of the Concierge Choice Award for Entertainment Services. It was all of your continued support that made us the best supplier of Broadway, sports, concert and event tickets in the New York area. It only took us 28 years to be an overnight success, because you think of us first when your clients need tickets." CCA nominees are selected and voted upon by the New York City Association of Hotel Concierges (NYCAHC), a select group of concierge professionals who represent the city’s top hotels. Awards are given every year in 14 categories, and include everything from Broadway shows to shopping experiences. A world wide provider of event tickets and entertainment services known for personalized and professional service for 28 years, Applause was previously nominated for “Best Entertainment Service” by the CCA in 2014. The 9th annual Concierge Choice Awards ceremony was held at Battery Gardens, in Battery Park, on September 21, 2015, and was hosted by the Davler Media Group. For more Applause photos of this exciting event, visit our Facebook Photo Gallery. Founded in 2003, the New York City Association of Hotel Concierges is an incorporated, not-for-profit group that fosters growth and development in the concierge profession and the hospitality industry at large. The association, comprised of over 140 members, represents approximately 51 hotels in the New York metropolitan area. Besides hotels, corporate members of NYCAHC include top shopping destinations, restaurants, sightseeing and tour companies. 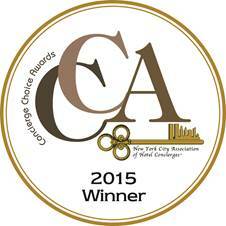 Visit NYCAHC.org or conciergechoiceawards.com for more information. Founded in 1987, Applause has been a leading supplier of theatre and event tickets to the theatre going community. Providing tickets for New York Hotel Concierge desks, Fortune 500 Companies, Tour Operators, Travel Agencies throughout the world, as well as the General Public has earned us an excellent reputation for our service as well as our knowledge, making Applause a respected industry leader in the theatre and entertainment business. Visit www.applause-tickets.com for more information or contact Richard Gladstone.